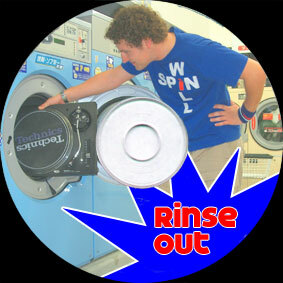 Rinse Out is strictly limited to 50 individually marked CDs at Flamingo Records, X-plosion and Creme. Now Sold Out I'm afraid. After the success of "Room 101" last year comes the harder edged "Rinse Out". 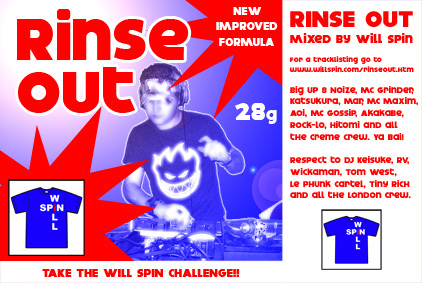 Rinse Out is the latest mix by DJ Willspin and captures the vibe of his fast and frenetic DJ sets. Godzilla would be proud of the havoc wreaked by this mix! 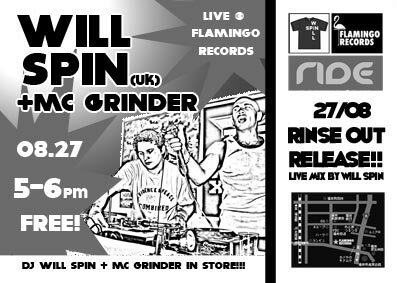 "This is the best selection of some of the tunes that I've been playing over the last year…and it's been a good year! It represents the kind of energy and pace that I put into my live sets. Every tune is a dancefloor destroyer in it's own unique way. It's a good send off to Room 101 and thankfully no neighbours attacked me this time!" Released on 27th August 2005 at Flamingo records, Fukui. Check out the pics. After selling out the mix is now available for download.